Dr. Derrick Stanbridge has been freeing people of pain for the last 10 years. He received his doctorate from Parker College of Chiropractic and undergrad Bachelors degree in anatomy and physiology through Weber State University. 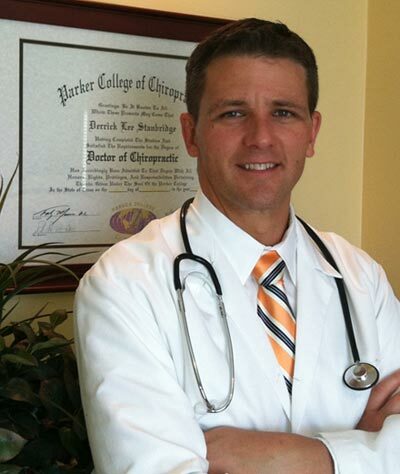 He loves being a Chiropractic Physician, because he enjoys seeing his patients get better naturally. He has continued post graduate studies in Pettibon, high and low impact automobile collisions, prenatal care, chiropractic pediatrics, cranial work, neurology, wellness physiology, and rehabilitation of the cervical and lumbar spine. Dr. Stanbridge continues to read, take seminars and pursue clinical excellence by keeping up with information that might be helpful to his patients. When he is not at the clinic treating patients, Dr. Stanbridge enjoys time with his wonderful wife, Jennifer, and their four beautiful children. He also loves cycling, mountain biking, snowmobiling, and water skiing. Described as a man who cares for the whole person--body, mind, and heart--Dr. Stanbridge’s trademark intuitiveness, knowledge, compassion, and follow-up care have made him a strong presence as an Ogden Chiropractor and in the state of Utah’s Chiropractic community.